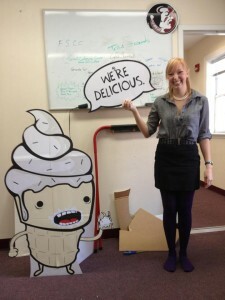 Sarah with Ice Cream Cutouts made for a dining hall party. Interning with Seminole Dining on campus has been a very interesting and educational experience. I am working as a pat-time Graphic Design intern in the Marketing Office. We oversee the marketing operations for three dining halls, over twenty retail locations on campus, Doak Campbell Stadium, and the Leon County Civic Center. Each location has its own brand-standards that must be followed, so we are essentially a small advertising agency. We create advertisements, coupons, menus, signs, flyers, manage social media, and keep our own website and mobile app. Almost all of our designs are printed, cut, and laminated if necessary in-house, so we do every step of the advertising process: from creating the promotions to designing the ads, and then producing and distributing the finished product. This has been a great experience for me because I have been involved in the whole advertising process. I am learning which kinds of promotions and advertisements work to bring in interested customers, and which ones don’t. Every day when I get into work, the first thing I do is check for my Aramark email and our Wufoo account. Wufoo is a website where managers of all our restaurants can submit requests for designs. I’ll talk to the other Graphic Designer, Vu Thai, and we divvy up the work. We prioritize by due date because we often have quite a lot of design requests. We have certain times of the year that are especially busy, such as the beginning of the school year and right before football season starts. Once we have created the designs, they must be printed and delivered to the correct location, which we do ourselves. This has been a great experience for me because I have been involved in the whole advertising process. I am learning which kinds of promotions and advertisements work to bring in interested customers, and which ones don’t. I have a communications minor, and I have taken a few advertising classes, so I am able to apply what I have learned in those classes to my internship. I have also learned great time management from this internship. For classes I would always take my time working on projects, but for this internship, I sometimes don’t have as much time as I would like to spend perfecting a design. I’ve learned how to quickly make effective designs. I hope to continue learning the valuable skills that this internship has been teaching me. My designs have been improving because of help from the full-time designer that I work with. I would like to have a better understanding of how our promotions are created, and I would like to get more of a chance to talk to more managers of restaurants on campus and work directly with them to create promotions.